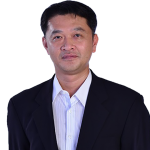 Arungsak (Jua) Jenarewong is BGA’s senior analyst for Thailand. He is an expert in information and communication technology (ICT) with over a decade of experience in the IT sector supporting companies, advising and aligning them with Thailand’s regulatory structure. Arungsak started working in information technology in 1994 as a programmer at NPG Information Technology where he was responsible for developing The Nation Online, a leading national news outlet. He also provided the IT framework for the U.S. Embassy’s HIV/AIDS collaboration program in 1997, before transferring to McKinsey & Company to serve as the company’s information technology coordinator. At McKinsey, he was responsible for coordinating and overseeing the IT sector in the Thailand office and establishing the telecommunications infrastructure for the Bangkok and Manila offices. He was then promoted to team leader of Southeast Asia IT infrastructure. In 2005, he moved to public sector to serve as a regional network administrator for the Global AIDS Program at Thailand’s Ministry of Public Health in collaboration with the U.S. Center for Disease Control. He supported the program’s computer technology and informatics at offices in Cambodia, China, India, Thailand and Vietnam. In 2007, he began working as a general manager at Bludot Communication Company where he served as chief information officer. Before joining BGA in 2012, he worked as an advisor to Gartner, one of the world’s leading IT research and advisory firms. Arungsak studied computer systems and programming in Los Angeles and received advanced diplomas in computer studies from centers in Singapore and the United Kingdom.